Expert floor fitters covering Bath and surroundings areas. We have over 10 years professional experience in various types of flooring. No job is too small and no job is too large. We accept advanced bookings and on occasion, can cater to last minute fitting requirements. The team have vast experience within domestic and commercial settings and will expertly advise and fit, catering to your individual flooring needs. We hold a wealth of flooring samples and offer competitive rates for both supplying and fitting. We shortly will be uploading an EBay page to sell any end of line stock or cuts of different flooring at discounted rates, so please consider us when purchasing your flooring too! For more information, or to see examples of our work, please visit the above website or 'troll' us on Facebook & Twitter! I am so impressed with the whole company and service I received! We went in 4 days before our carpet was fitted, not only did Anne Marie give us some amazing advice and lots of her time to help us choose, but she also squeezed us in at such short notice. So happy with the one we finally chose and it looks beautiful. Really well run company, who genuinely have your best interests at heart and really good value! Thank you so much. Laying of LVT flooring to the hall and carpet to the stairs and landing. Very professional and suburb result. Fitters were curtous and efficient. Will definitely use them again and have no worries about recommending them. Large flat fully carpeted to our expected standard. Laid carpets, lounge, stairs & bedroom. Very clean & tidy, made a good job of fitting it all! 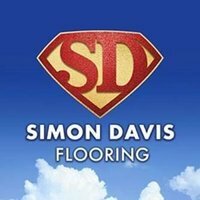 Simon Davis laid vinyl flooring in our bathroom and carpet in our bedroom. The accuracy of their quote, communication with us and completing the actual work was faultless. They did everything they could to ensure the job was booked in ASAP, everyone was courteous and we were thrilled with the finished job. Very pleasant and reliable company who seem to go that extra mile to make sure that their customers are satisfied. Polite, excellent fitting. On time, even hoovered up afterwards which I have never known before. Good job all round. Will definitely use again, very happy.